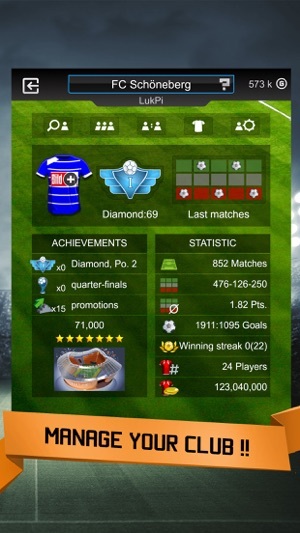 "GOAL Manager" is the only manager game that is completely free and does not have any in-app purchases. As a manager and trainer at the same time, you kick off your career with fictional players assigned to you and then you develop your own club. 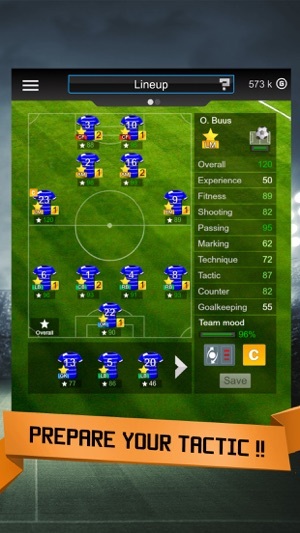 Your goal is to lead your team to fame and success from the first season on, assemble your squad by means of clever transfers, name your starting 11, develop your very own tactics and build your stadium. Along with your friends, climb up from the lowest to the highest league in global competition. Leave the pitch as the winner, become the champion and rise to your greatest challenge in the Champions Cup against thousands of real opponents. GM is 100% free and will remain free throughout! No in-game purchases or pay-to-win options! In this manager game, your success depends solely on your management skills. No Facebook or e-mail registration required! With the new guest account, simply click on “Play now,” choose your favourite club name, select your country and then get started with your manager’s career. Beat out other managers in the live auction. 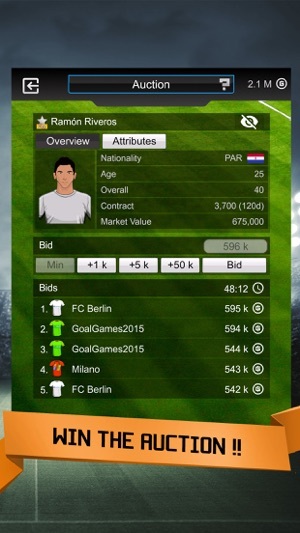 Bid on your favourites in the interactive transfer market. Develop your football players from inexperienced young players to proven pros, superstars and all the way to legends. Get the most out of each individual player’s best skills and observe how the statistics in the player profile improve. LEAGUE AND CUP MATCHES: Win your league games, fight your way up to the top of the table, move up into the next-highest league by the 22nd game day and compete for the Champions Cup. 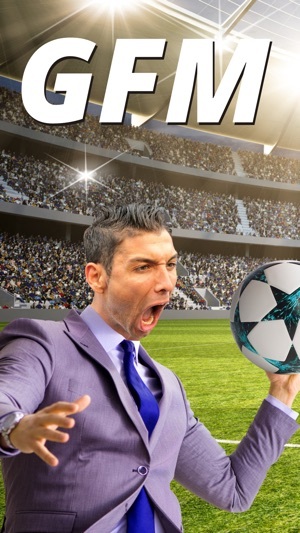 LIVE TICKER: Celebrate your winning goal in the live ticker! 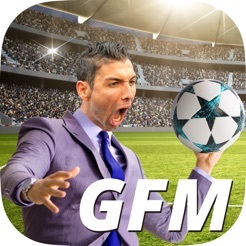 GOAL Manager offers you a lively, emotional summary of the games. Take care of your finances. Choose your sponsor and define the tactics for your upcoming league matches. Analyse your squad, pay the salaries and extend contracts. Monitor your game plan, your results and the table in order to get your team ready for the next opponent. 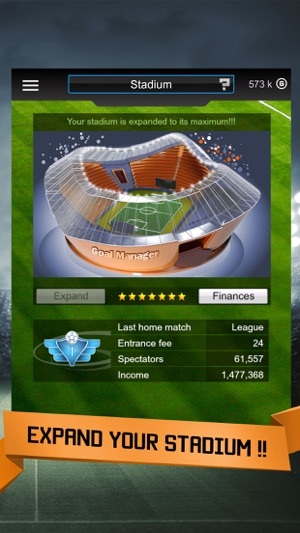 Construct your stadium in order to earn more money and win over more football fans for your team. FRIENDS: Using your friends list, invite your friends to play with you in the same league. Chat with your friends about your latest experiences and challenge them to friendly matches. LINE-UP, JERSEYS, STADIUM...: Choose the 11 kickers, your formation and your plan for the league and cup matches. Make investments in your stadium and expand it to make room for more fans and bring in more revenue. Choose your jersey design and your favourite colours! GM is a must for all football fans when it comes to proving to yourself and your friends that you’re the better manager and coach. Starting with this version you don't have to watch videos anymore to receive the Goal Coins. From now on you will get the coins automatically, together with the rewards, simply by doing a daily login. Also we added a button for promotion codes into the app. It will show up at the first login, when being asked for the teamname. We will hand out new promotion codes from time to time via different platforms, this will give new teams some advantages at the beginning. The promotion code will be useable only for new teams and only one single time. I love the model of this game. Rather than building their income from the players who could like in many games pay $100's over a period of time, they instead offer the game entirely free but have real businesses act as team sponsors who pay the developers for the opportunity to advertise in the game as a built in game mechanic and your team's main source of income. There is also banner ads and the occasional pop up ad but you can quickly click off those and they are not obnoxiously frequent, nor are you forced to watch videos. 1) ability to see next opponents team, formation and style of play from last match. Thus allowing you to reactively plan your strategy. 2) to be able to make substitutions that are triggered by match events, such as opponents leading by 2 goals. 3) to be able to change team tactics depending upon match events. Such as above, or maybe gaining a comfortable lead and wanting to maybe sit back and defend rather than attack as much. - you should creat a youth area for young player so you don't need just to buy the players. For the games of the youth you just should play them as they play in the "adult" league. For squad/practice should be an option to do this(same as in principle as in "adult" league). And there should be an age limit when they need to leave and an option that they can leave earlier(like between 16-21).